What is your usual working position? For the majority of people, the answer would be: sitting. But there is an increasing amount of evidence which suggests that sitting for prolonged periods is extremely unhealthy. We’re not just talking about the obvious bad posture and muscle ache here; sitting has also been linked to chronic health concerns, ranging from cancer to diabetes and even heart disease. So what’s the solution? Standing might appear to be one option. Indeed, offices around the world have started integrating ‘standing desks’ into the workplace, and this approach does seem to reduce the chances of those health concerns. But on a practical level, standing up all day might not cut it. It’s unlikely that your average worker will be able to stand for eight hours, and the accompanying fatigue will not do much for the quality of their work. Fortunately, there is a happy compromise, and it’s known as active sitting. Many claim this to be a more sensible approach to long-term sitting. If you are wondering how exactly one goes about sitting actively, the answer lies in the kind of chair you use. 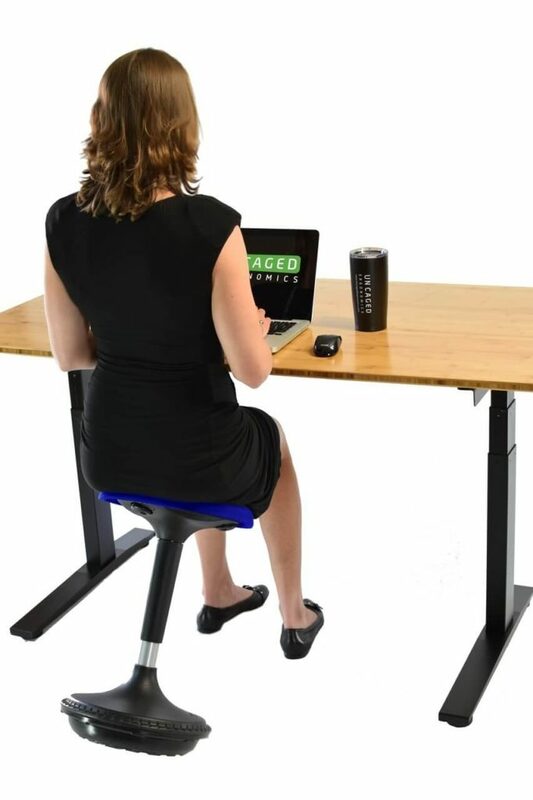 The Wobble Stool, from Uncaged Ergonomics, is one such solution. Essentially, this is a bar stool with a difference. It has an adjustable height so you can make it just right for you – and it lacks the rigidity of traditional chairs. 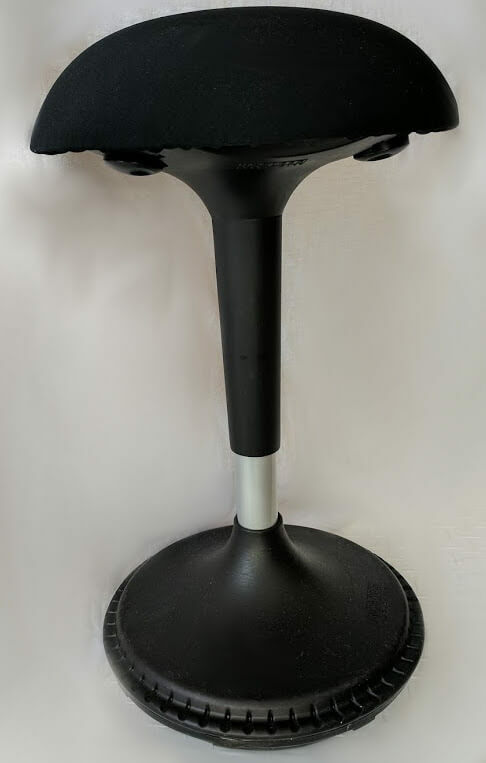 Read on to discover why the Wobble Stool is one of our highest rated products for good posture while sitting at your desk. The first thing I noticed while sitting on the Wobble Stool is there is no one fixed position. Being able to move around can be simultaneously fun and a little unwieldy at first. Sitting on the stool, I could lean forward easily, lean back just as easily, or even wrap my legs around it. There were no limitations to how I can sit on it. Most of the time, I would sit with my feet flat on the floor, with excellent posture. This position took a small amount of effort. Being in this position meant focusing on intense tasks on my computer. Then I could lean forward which would allow me to come up for air, so to speak. I started with an hour and half of use the first day. I sit in a “power pose” while using the Wobble Stool, and had to raise my computer monitor to match my height. Each day I add a bit more time. Eventually, I plan on using this stool for 5-6 hours per day. It is stimulating to sit on, and each time after I feel energized and refreshed. Your body requires balance with the Wobble Stool, although only slightly, and it is giving you a small workout. Don’t be mistaken: you won’t feel as though you are breaking a sweat at your desk. But you will certainly burn additional calories throughout the day, and that’s something nobody can argue with. Who doesn’t want to burn calories even as they work? Sitting on the Wobble Stool is not just enjoyable, but good news for posture too. Proper posture is the basis of active sitting. You can experiment as you sit on the stool throughout the day, and find your ideal spot. 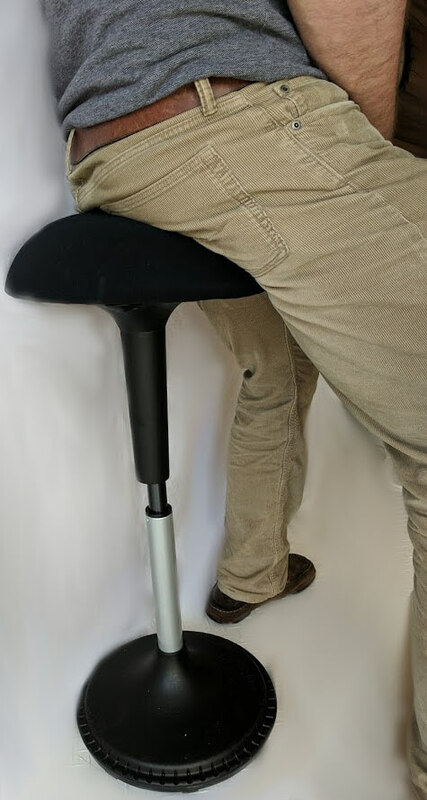 Most positions on the Wobble Stool are excellent for posture, although you can lean forward too. However, this beats leaning forward all day, every day, working on a desktop or laptop. With this, you can sit with perfect posture, burn calories, then take a break after several hours. Active sitting has been shown to improve the health of your joints, as well as being able to encourage blood flow throughout the body. Plus, its positive effect on posture leads to even further advantages, from an improvement in oxygen intake to opening the airway in the lungs. Pricing is around the same price as a standard office chair, so you do not have to splash out here. On the whole, I highly recommend the Wobble Stool for anyone who wants to be a little more active at their desk. With it, you can build your core, improve your posture, and possibly keep negative health problems at bay. Using the Wobble Stool over months and years of sitting could make all the difference in your health.